As I was stringing up some new fencing for the cow's new paddock I peered into the trees and saw a little head poke out. I was pretty far away, so I thought it might just be Corrina's nose. Then I saw it stand up and do a gangly little walk out into the sunlight. What!? Is that a baby calf!? It was a bit surreal. Sure enough Janis had her baby, just as expected, exactly 11 months after her last calf. That means she was bred about 45 days afterward. I called and called Sweetbreads, but she was milking. I sent a text and she opened it up and then came running down the hill. 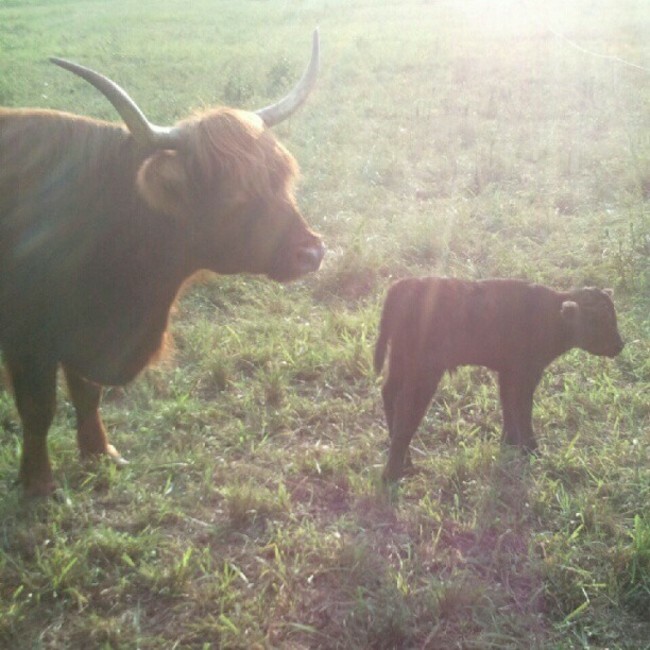 First birth on the farm! On top of both of our birthdays and our anniversary we now have another reason to celebrate in August. Anyway, back to the calf. She's incredibly fuzzy and very friendly. Janis isn't protective (or I may be sporting a hole in my torso), so that's a plus. She's a chocolate color because Janis was bred to a black bull, so she'll probably end up being black like Corrina. She has a little bit of 'scours' (diarrhea), but that's not abnormal. We'll keep an eye on it. Janis had completely dried her off by the time I saw her, so that's good. No signs of blow flies, which could kill the baby. 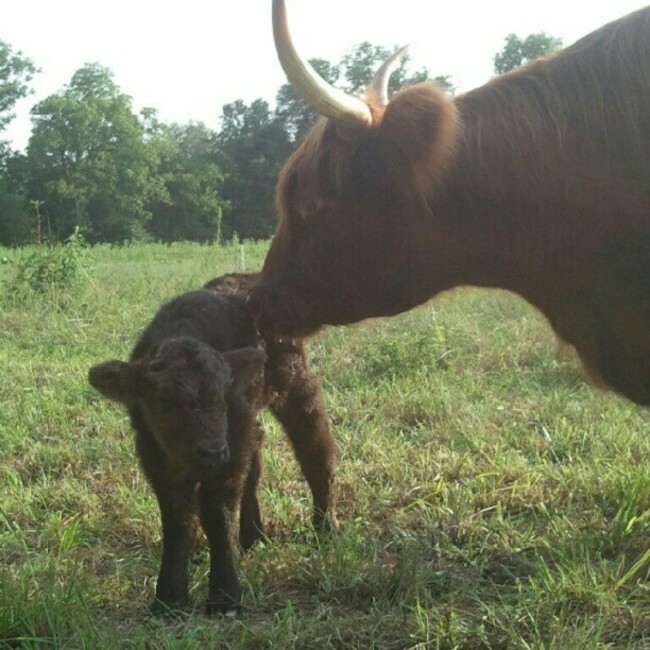 There was no loud mooing coming from the fields today, so I'm guessing she was born last night. And I'm also guessing it's a girl because I didn't see anything dangling behind the umbilical cord, but then again I've never seen a day old calf before, so I'm not to be trusted. I suppose we'll find out for sure sooner or later, maybe I'll take a better look tomorrow. We've yet to see her nurse, despite hanging around the paddock for an hour or so and watching the baby get very close to the udder. 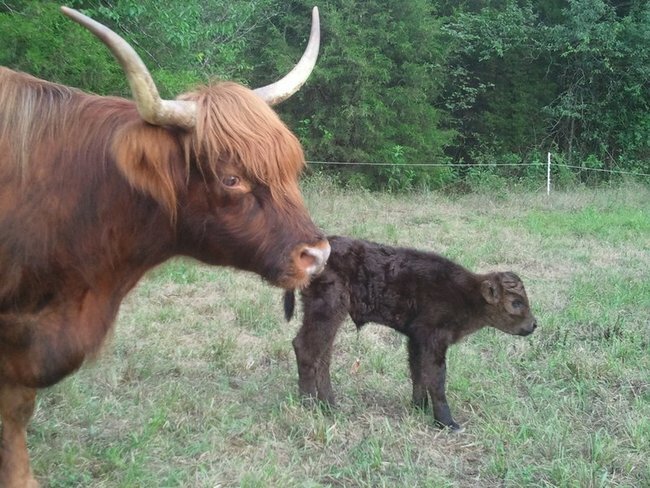 The little calf tried on numerous occasions to nurse Janis' brisket (the flap hanging down from her chest), so I'm a little worried that she's not yet figured out the udder. However, one of Janis' four quadrants (i.e. one of the four teats) was very deflated when compared to the others, so I imagine she got some milk at some point. After raising up Willow from only 3 pounds I'm still surprised by how big the calf is at one day old. She's gotta be at least 30 pounds (although again, I have no experience with these things). We hope she does well! Janis seems to be doing a great job so far. Lots of soft moos, unless the kid gets too far away, then it's a big, strong moo. Animal noises to their young are incredible. Bridget makes mother goat noises to Willow now, it's pretty cute.